As we all know, rather than dealing with his administration or helping the people in Florida, Texas, or Puerto Rico our president decided to speak about the “controversy” of football players kneeling at the American flag rather than the “traditional” (post WWII) hand over the heart. Before WWII American children saluted the flag as shown in the picture below. 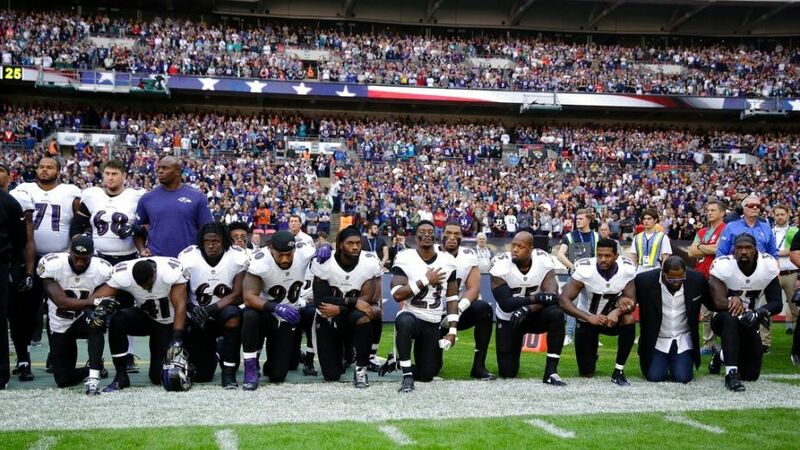 Now more players than ever are kneeling at the American flag to protest the president than to protest what others were last year. Is there at law saying one must stand for the National Anthem? No. In West Virginia State Board of Education v. Barnette (1943) the Supreme Court of the United States ruled that choosing not to salute the flag or say the Pledge of Allegiance was a freedom we have due to the First Amendment. The flag is not America and America is not its flag. We are a group of people who have chosen to live together under a set of laws and principles. Look at our Bill of Rights and read Justice Jackson’s words and you will see what it means to have freedom of speech.